I had a long run Saturday and a long ride Sunday which is the perfect time to dial in the nutrition. On Saturday, I had a GU 10 minutes before I left, another at 45 minutes in, and a third at an hour and a half. I also drank a bottle of Ironman Perform on the run, that is the sports drink that will be available on race day. Once I found out it was the drink on race day, I ordered a case of each flavor from a place that I get a discount from and that has free shipping on orders over a certain amount. I've been drinking it during various workouts for the last two months and it sits well with me. I also tried out salt tablets during the run and noticed no difference in performance. On my long ride Sunday, I filled my aero bottle with water, and two water bottles with Infinit bike formula. The Infinit sits well with me too, but I've learned through trial and error that I like variety. So on the ride today, I ate a Cliff Bar and drank water for the first hour, drank Infinit for the second hour, ate Gu Chomps and drank water for the third hour, and went back to Infinit for the fourth hour. 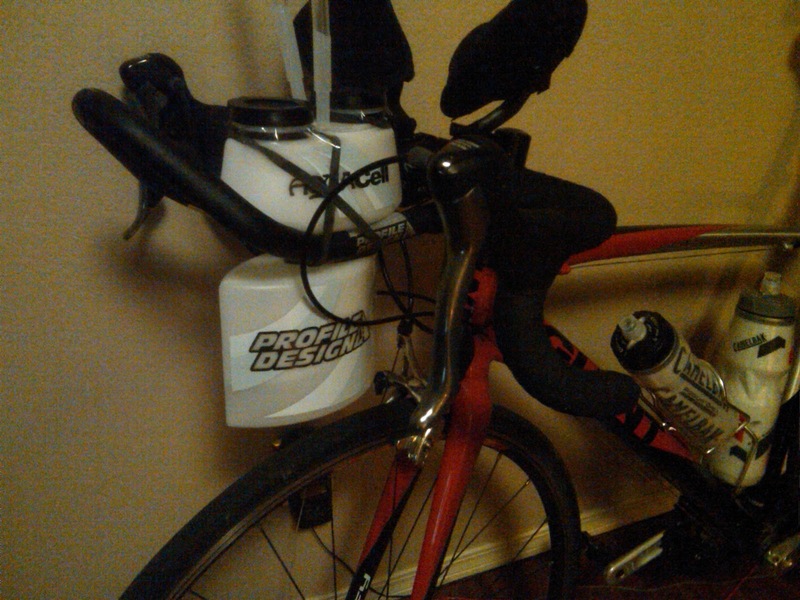 After a couple rides with it, I've decided I'm ditching the aero bottle. I have to stop pedaling and lean forward to drink from it, the straws poke my helmet if I look at the ground, and it's kind of bulky. I'm going to opt for two water bottles, one with water and one with Perform. I like Infinit, but I decided to live off the course for hydration. Besides nutrition, I've also learned I don't have the patience for long plans. I'm on a 20 week plan and this week I was wishing it was a 16 week plan. I was ready to get this race going so I could stop obsessing about it. Every workout for the last 16 weeks I've thought about NOLA. How will I feel on the run after the bike? How will I handle my longest OWS by 2X? How will the humidty be? NOLA, NOLA, NOLA. I can't imagine doing a 27 week plan. You had such a beautiful day for your long ride! It sounds like you have a cast iron stomach! Good for you! My only advice, you need to make sure you consume enough water on the bike. However, when I drink a ton of sports drink, when I start to run I feel bloated. For me, I consume almost all of my calories from gels and use the liquid for water. In addition, I hate the sticky nature of sports drink and I have a tendency to spill. Just my 2 cents.